Many of Richard Strauss´s compositions had their world premiere in Dresden and the composer dedicated An Alpine Symphony to the Dresden orchestra. It is apt, therefore, that this performance is given by the Staatskapelle Dresden under the direction of Christian Thielemann. 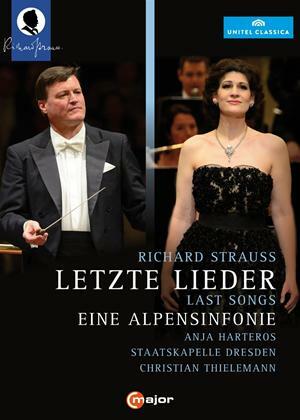 The programme includes Four Last Songs, Wolfgang Rihm's Ernster Gesang and the German premiere of the last completed Strauss song: Mallows, in an orchestral version arranged specifically for Dresden by Wolfgang Rihm. The soprano in these performances, Anja Harteros, is enjoying a flourishing operatic career with recent performances at the MET, Covent Garden, La Scala, and Salzburg Festival.